CEO and Founder – Indigo9 Digital Inc.
Before applying to the Commerce program, Tricia McKinnon (BCom ’00) considered three options: psychology, criminology, and business. Her passion for business won. “Since I loved business and economics the Commerce program felt like the best fit,” says McKinnon. During her undergraduate years McKinnon developed strong friendships, participated in a national case competition in her third year, and founded a student group. These activities are part of the foundation of where she is today . The friends that she met in in the Commerce program, taught her effective study skills, and she credits them with enhancing her academic performance in the program. Competing in the EDS National Case Competition, where she and her team placed second, helped her to develop her presentation skills which have been an asset in her strategy consulting career and now as an entrepreneur. “It was an amazing experience and I created deep bonds with my teammates. But looking back, we prepared for that competition for what now seems like an insane amount of time…months. We were very intense,” she laughs. Another way McKinnon prepared for her future was through graduate study. “Early in my career [at Deloitte] I noticed that a lot of the Partners had advanced degrees. I also noticed that a few years out of undergrad a lot of my classmates had designations (CFAs, CAs etc.) so I felt like I was falling behind and I didn’t want to miss out on opportunities just because I didn’t have a degree or designation that I could easily get,” says McKinnon. So with four years under her belt at Deloitte, she returned to Rotman to complete her MBA. For McKinnon, the education she received both in the Commerce and MBA programs has paid off. 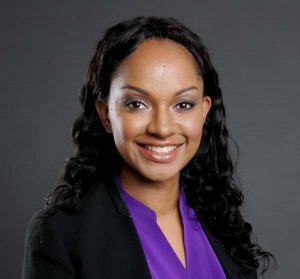 Outside of her career at Deloitte, she has also held senior-level strategy roles at Sears Canada, Holt Renfrew, and Cadillac Fairview. Her current business passion, though, is the company she has just founded, Indigo9 Digital Inc. (www.indigo9digital.com), which helps organizations to accelerate their sales growth. Remaining actively engaged with both undergraduate and MBA programs is very important to McKinnon. She is involved in the Rotman Commerce mentorship program, in which she mentors two students, and volunteers on an ad-hoc basis at Rotman MBA events. McKinnon recently increased her level of involvement by joining the Rotman Commerce Alumni Steering Committee. “I joined because I wanted to do more volunteer work. Since I have always loved U of T (I have 2 degrees and recently completed my Digital Marketing Management certificate there) it made logical sense to focus on volunteering there. It’s important for alumni to stay engaged with Commerce because having a strong network is an important part of your career success. It’s also fun to stay connected with people that have a similar background and career interests as you,” enthuses McKinnon.